Aaron Betsky: "Rei Kawakubo is an architect of clothes"
"Rei Kawakubo is an architect of clothes"
The Met's Comme des Garçons exhibition demonstrates how forward-thinking designers like Rei Kawakubo are using new digital crafts to manipulate both the body and architectural space, says Aaron Betsky in his latest Opinion column. There is a mix of architecture and fashion in the exhibition of Japanese fashion designer Rei Kawakubo's work at the Metropolitan Museum of Art in New York. 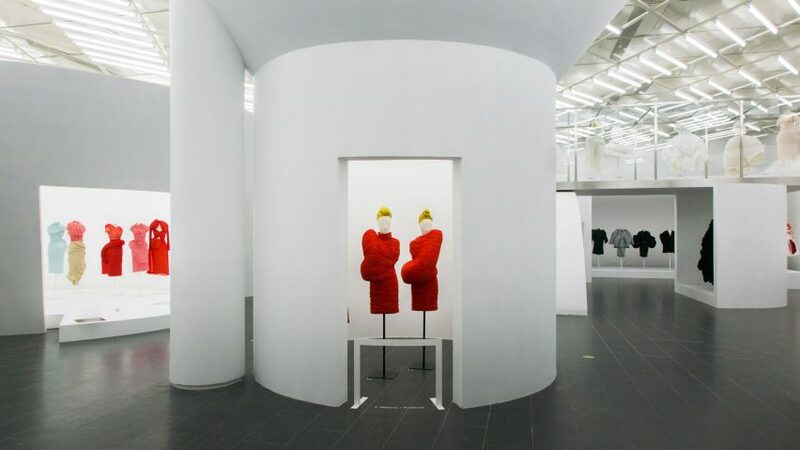 Not only is Kawakubo, who founded and runs the label Comme des Garçons, an architect of clothes, creating structures and shapes the body occupies as an independent entity, but she also designed the display. A collection of compound curves carried out in white that plays call and response with the displays, the design is as idiosyncratic in its relation to what it houses as Kawakubo's clothes are by design. The exhibition reminded me of the ways in which fashion and architecture are increasingly becoming intertwined as they figure out how to make sense of the world in which they operate. This is not just a question of architecture becoming more fashion-oriented. Yes, it is becoming more ephemeral, image-oriented, and subject to the cycles of fashion, including its continual references to classic periods (classical, baroque, rococo, neo-classical) and its appropriation of previously outré form for use by the elite. But, in addition, technology, craft, and fluidity of form are causing the opposition between things we wear and things that shelter us to dissolve in favour of structuring both individual and social persona. The dissolution of the frozen forms of building into more fluid shapes due to the use of computer technology by the UNStudios of this world, the assimilation of popular culture elements onto facades and even into the fabric of buildings by the likes of OMA and its spawn, and the reemergence of the idea of architecture as something based on the history of tents and textiles have all softened the edges of architecture. Meanwhile, the attention paid to various ways buildings can respond to the human body, first crudely through "human factors engineering" and its even more scientifically dubious cousin, "evidence-based design", and now through the rehabilitation of James J Gibson's notions of affordance by firms as diverse as Zaha Hadid Architects, RAAAF of the Netherlands, and Snøhetta, is also blurring the boundaries between adoptive responses to the body and the frameworks of architecture. Finally, the popularity of the German philosopher Peter Sloterdijk's notions of "bubbles", "foams", or "spheres" has led inquiring architects to find communality between the enclosures they propose and the swaddling surroundings of clothes. At the same time, fashion designers have looked for inspiration to architecture. Minimalist designers from Pierre Cardin to Ralph Lauren and Tom Ford have proclaimed their love for a stripped-down version of modernism, seeking to abstract the body into floating planes and uniforms that show us as parts of a larger machinery – though some with more means float above it in a white blouse or the perfect black dress. Designers such as Hussein Chalayan have gone further, imagining their couture as becoming furniture or integrating their designs into environmental manipulations of spaces. A few architects, such as Nigel Coates, have also moved into the design of objects that are hybrids between buildings and objects of fashion. Throughout this period, some fashion designers have stuck to the traditions and skills of their discipline, finding ways to not so much blur the boundaries, as to understand that similar issues – shelter and comfort, function and form, beauty and delight – animate both architecture and fashion. Their revival of past types, from bustiers to layered dresses, historical patterns they sometimes found at old textile mills, and the crafts associated with them, most eminently by the likes of Vivienne Westwood, but also in the work of Parisian couturiers such as Jean-Paul Gautier, has paralleled the revaluation of ancient crafts and historical types in architecture (as it has, of course, in everything from literature to music). The result has been neither mimicry not integration, but an echoing of concerns and styles. In my mind, Kawakubo's work epitomises the latter approach. Starting in the late 1990s, she developed forms that bulged, billowed, and squeezed out of the body, adding appendages and fabric prosthetics that had little seeming relations to the body its clothing. Though she referred to deformities the body might have – such as hunchbacks and tumours – in describing the Body Meets Dress/Dress Meets Body line (1997), over time it became clear that what she had in mind was an exploration of the sculptural and spatial potential inherent in couture. If traditional fashion used knowledge developed over centuries of cutting, shaping, and sewing to fit the body – containing it, cushioning it, emphasising its best features and hiding others – she used the same craft to create forms that were wholly independent and often in contrast to the human form. At times, as when she turned a man's double-breasted, Prince of Wales-checked suit into the site for arms fit for the Michelin man (The Infinity of Tailoring, 2013), extra sails of cloth unfurling from underneath the lapels, and cut-off, wide pants (Persona, 2006-7), the shapes had the effect of either emphasising or satirising the power these suits were meant to express. At other times, they picked up on the tradition of turning the body into an abstract object of a larger scale, an effect Kawakubo achieved with hoop skirts, bodices, hats, and other structural extensions or additions (Ceremony of Separation, 2016). She also either abstracted them or turned them into hybrid characters in which the large skirts turn into masses of intertwined tentacles (Not Making Clothing, 2014). The effect of all this work was to make her creations have an active and critical relation with the person wearing them, in terms of both her or his personality and body. Who you are and how you appear, Kawakubo showed, could be something flexible and designed. Fashion could have the same ability to frame and deform your public appearance and your personal sense of comfort that architecture long claimed. Just as a house could be a large and abstract version of how you saw yourself, or how you fitted into society, and just as an office building could both fit and extend corporate power, so fashion could make the human body into the beginning point, not the end, of who we are and how we appear. Kawakubo's other technique, that of tearing apart her dresses into strips and collaging together to form incomplete costumes, made her fashion into a form of quotation as flexible and full of blurred edges as the flow of images that surrounds us and appears continually on our screens (Inside Decoration, 2011). We observe our reality in such smears of colour and form, in which time and space matter less than the strength of something we see out of the corner of our eye, and Kawakubo entered into the imagosphere with abandon, while trailing the history of couture so that she could make that floating world her own. All this appears at the Metropolitan Museum exhibition in architecture that is equally distended and distorted. The costumes stand in alcoves that are combinations of half- and three-quarter-circles, in cut-off squares, in cylinders, or cantilevered display boxes. You wander through these cast-offs from a search for ideal architecture without any clear path. The unglazed vitrines recall buildings while sheltering and framing their subjects, but they do not seem to have a logical relation with either the fashion or the viewers. The whole assembly sits under the glare of fluorescent tubes, with no attempt to spotlight any of the fashion's fine points. Kawakubo's architecture is as much a play of fragments cutting apart our sense of definition and certainty as her clothing designs are. I came away from the Rei Kawakubo exhibition with the sense that there is, in fact, no fixed point of reference for any of those arts that mirror, map, or frame our world. Both the body with its fixed proportions and functions, and the single perspective and point of view we gain from that corporeal container, are supposed facts we can manipulate. The context is what we make it. Craft can defy gravity as well as function. Image can become form and vice versa, but never completely. These are the new rules of design in architecture, in art, and in fashion.